a) Mechanical processing includes methods that do not use solvents or excessive heat to extract the oil. These methods include centrifugation and (now, rarely) pressing. b) Pomace is the mix of skins and crushed olive seeds left over after most of the olive oil and water have been mechanically extracted from the olive paste. c) Usually hexane is the solvent used. d) Refining involves a number of steps which involve the addition of strong acids and bases, and the application of processes such as chilling, washing, centrifugation, filtration and deodorisation. 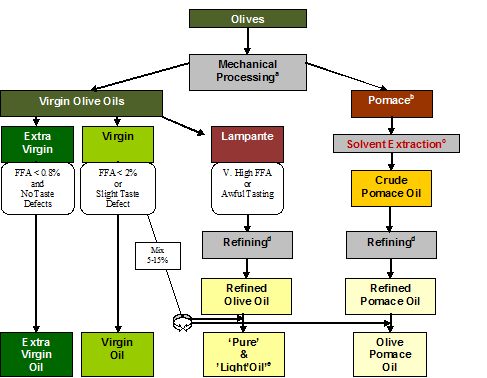 e) Pure olive oil is no ‘purer’ than any other olive oil. 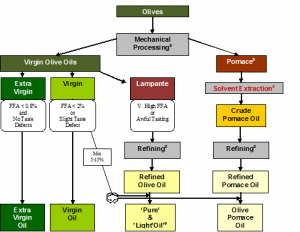 ‘Light’ olive oil does not have fewer calories than any other oil. The term ‘light’ refers to its lighter colour, aroma and flavour – a result of the oil having been refined. Thanks for the reminders. I’ve incorporated the links into the post. And yes, Amandas infographic is a cracker. I have seen it in real life as a poster but I didn’t know she had posted it.